My personal tale of using Ayahuasca for the first time to enhance my spiritual journey, but instead experienced the worst night of my life. After a day at the beach, my husband drives me to a nearby residence where I will drink a concoction made from Ayahuasca, a vine from the Amazon jungle, combined with another plant containing DMT. 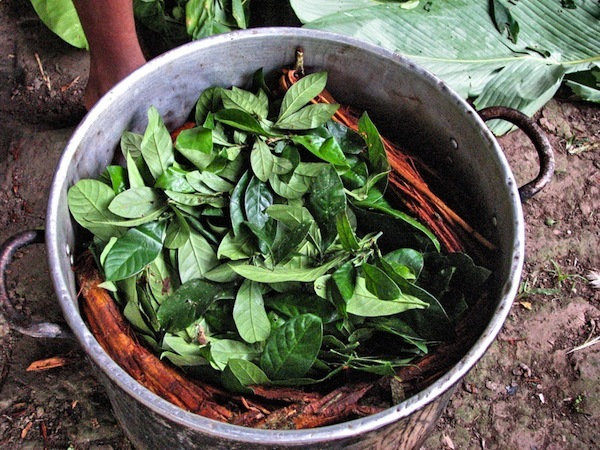 Ayahuasca tea, also called yagé, is a psychedelic brew used by shamans and indigenous peoples in the Amazonian jungle to reach an altered state of consciousness, allowing them interact with the spirit realm. Many people claim that Ayahuasca has amazing healing powers; some tout that the experience is equal to 10 years of therapy in a single night. My personal goal is to heighten my spiritual connection to the divine. We pull into the driveway and get out of the car. I carry the recommended “gear” of wet wipes, paper towels, sleeping bag, bottled water and a pail for vomiting. My friend and his girlfriend warmly greet us. After an hour of small talk, my husband leaves—he did not plan on participating, and the hosts worry that he might get overly concerned when I start throwing up, interrupting the experience. The hosts spend an hour explaining what I should expect from Ayahuasca. They mention that geometrical codes might appear, and at some point I will need to surrender my ego to break through to the “other side” to meet the divine. The hosts tell me they’re giving me their greatest gift, and assure me that Ayahuasca has been life-changing for them. We go outside to sit on the deck overlooking the inlet. Two small jars are placed on the balcony railing. I open the first jar and drink the reddish-brown liquid in one gulp. I had read that the concoction would be bitter, but it tastes more like a strong herbal tea. After 20 minutes, I drink from the other jar. It too goes down easily. After a little while, my body heats up and I notice that my vision is flickering. I suggest that we go inside so I can lie down. I lay on the couch, propped up by cushions. The hostess lays a crochet afghan over me. A transparent geometrical code appears across the room like a hologram. A booming sound begins. Part of the geometrical code bounces before shooting into my energetic body. I accept the code since I had read that the symbols were supposed to heal a person’s DNA. Everything seems to be going well. The geometrical codes keep appearing, accompanied by the strange bass-like tones. Jungle sounds fill the room. I feel that Ayahuasca is sharing her heritage with me. Interspersed between the geometrical codes, I hear snippets of voices issuing instructions, “Cue. Ready? Now!” and I wonder what is going on. It sounds like a TV production team is in the background orchestrating the event. It reminds me of the movie ‘The Truman Show’ starring Jim Carrey—the one where he was living in a TV show, but didn’t know it. The abstract painting on the wall changes into a portrait of a Geisha girl wearing a multi-colored robe. I am sucked back into Ayahuasca’s realm, and a traditional Mayan mask appears, but I see a dark figure holding it, moving it around. The event seems contrived. The geometrical codes kept coming nonstop, infusing into my body. I wonder if the force behind these codes is benevolent or malevolent. I ask for inspiring messages, but get none. I ask the force to send me love because while it might be able to shape-shift into deceptive images and sounds, it can’t fake love. I don’t feel any love, only darkness and a huge, empty void. I am scared that the plant has exposed me to its dark side—the archetype power of black magic that has accumulated over thousands of years, or perhaps worse, the ultimate struggle between good and evil. At this point, I ask it to stop, but the geometrical codes and sounds keep coming, over and over again, and the words, “Cue. Ready? Now!” ring out. I shout in my mind, “NO! I invoke the Universal Law of Oneness and ask you to stop!” But the codes and sounds continue barraging me. Since I know the Divine Source never forces itself on anyone, I become convinced that dark forces are attacking me. I ask the Great Spirit for help. I call on my spirit guides and enlightened teacher, Jesus, for help. It feels like I am dying. I have a fever and shiver uncontrollably. The hostess puts another blanket on me. I listen to my heartbeat, which slows down, then eventually stops. I gasp for breath and my heart resumes beating. I take a sip, but it is extremely difficult to drink more than that. The geometrical codes begin again. I invoke the Universal Law of Oneness, demanding that it stop. Finally, it does. I ask Aya to remove all the codes already infused into me. The codes are forcefully extracted all at once. It’s painful and overwhelming. I begin to projectile vomit while silently screaming, “It’s all a lie!” over and over. One of the hosts holds the bucket. The vomit seems to come from deep within my bowels. The same concoction that went down so smoothly is extremely bitter coming up. For the first time since this began, I have a glimpse of normal reality, but it flickers away quickly and I am again back in Aya’s grip. Although the geometrical codes have stopped, Aya continues shooting sights and sounds at me—all with a dark, jungle backdrop. I offer everything that is appearing to the Great Spirit for healing. It has become a battle for the control of my mind. It takes extreme concentration on my part to stay conscious, and I am convinced that I must stay awake to win this battle, but it’s difficult because I am exhausted and sleep beckons me like a sultry seducer. The gentle Voice reminds me to drink water. It takes considerable concentration and fortitude to down another bottle, which is followed by another round of projectile vomiting. 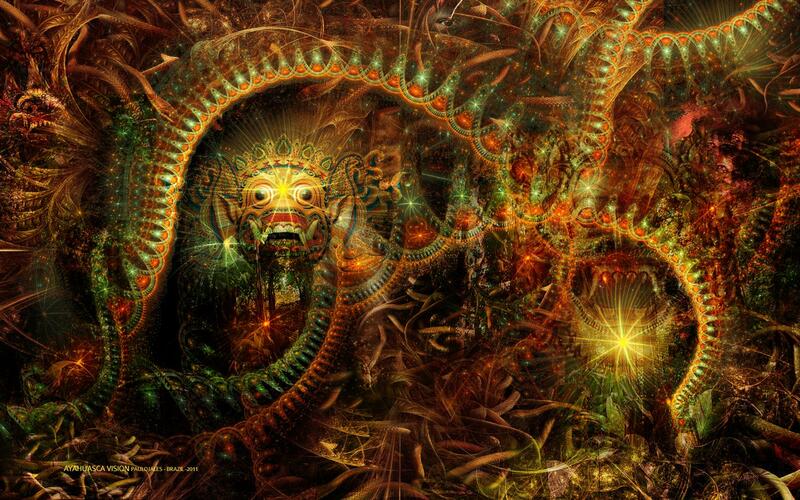 In my haze, I realize that my expectation of Ayahuasca being a fast-track to enlightenment was a mistake. I should not have expected a plant spirit to do the work for me. I hear the Voice say, “Everyone is already enlightened. You did not need to do anything.” I feel foolish. Suddenly, I think of my husband. I have a vision of him, and see his spirit as my guardian angel. I urgently want him here with me. I mumble to one of the hosts, asking her to call my husband. I go in and out of reality. It takes incredible focus and determination to resist merging with the dark forces. At this point, I am thankful for my experience with shamanic journeying and healing; otherwise, I would be at a loss on how to deal with this. I ask the hostess to turn on the lights. I am tired of the darkness. I fall back under Aya’s spell. My father, who passed away ten months earlier, appears with dark entities dancing around him. He wears a green cloak made out of Ayahuasca leaves. He asks me to join him. It is a bittersweet moment because this is the first time I have ‘seen’ him since his death, but I believe the dark forces have shape-shifted into his form to trick me. I’m not sure, so I tell him, “If that really is you, I’m sorry because I won’t join the darkness.” He disappears into the black void. “It’s all a lie!” blares through my mind, followed by another round of projectile vomiting. My husband finally arrives, and sits on a nearby chair, trying to assess the situation. He sees me with wild hair, talking nonsense and holding a pail lined with vomit. He is rightly concerned. I ask him to sit next to me because I need to feel his loving energy. The hosts leave the room to give us privacy. I tell my husband that I never knew how much I loved him until now. This makes him happy. I look around the house. The painting on the wall changes again. It displays a devil seducing a woman. I consider that a bad omen and want to leave, but I am unable to walk. I have to wait. I babble on and on about what I am seeing in the other ‘reality.’ My husband listens patiently, but is visibly tense. He escorts me to the bathroom. I go in by myself, balancing against the walls and sink countertop. I manage to sit on the toilet and urinate for the first time since ingesting the concoction—a positive sign. I wobble to the sink and wash my hands. I look at myself in the mirror. I don’t look as bad as I feel. My husband is waiting for me when I open the door, and helps me back into the living room where I sit on the couch. I drink more water. A minute later, I throw up, but it’s less forceful this time. I stare at the water bottle. The water sends me a vision. I see the ruined Fukushima nuclear plant dumping radioactive wastewater into the ocean, a pipeline leaking over the United States’ largest aquifer, and fracking machines pounding chemicals into water supply. The water tells me they are killing us by contaminating the water—another form of global genocide. The Voice reminds me to drink more water and I do, grateful that it is unpolluted. My husband doesn’t know how to respond and wants to leave since enough of the Ayahuasca has left my system that I am able to walk with help. He gathers my things and carries them to the car. I wait on the couch. While he is outside, the hosts’ cat comes into the room. She sits in front of me and stares. I believe she is a fairy helping to balance the home’s energy. Her ears look like wings. My husband returns and sits next to me. The cat stares at him, then walks closer. She sits up and puts her arm on the coffee table like a human would. My husband mentions that he has never seen a cat do that. I tell him the cat is fairy. He says it is time to leave. It is now 1:30 a.m., and the hosts have long-since retreated to their bedroom. I text them to let them know I am leaving. My fingers stumbled over the keyboard. Autocorrect makes the message come together. I wait a minute. There is no response so I leave. My husband escorts me outside. The warm breeze is refreshing. Arm in arm, we go down the stairs to the car. He drives slowly back to the hotel. It feels so good to be back in this reality. We pull into the hotel parking lot, which is full, forcing us to park on the other side. My husband holds my arm as I totter across the pavement holding a bucket, looking like a bad drunk. Back in the room, I’m afraid to fall asleep—afraid that I will be pulled back into that psychotic hell. I keep drinking water. I suspect that I have nodded off, but I am not sure. I go to the bathroom again, grateful to urinate more of the substance out of my body. This repeats every 40-60 minutes, leaving me with very little sleep. The next morning I feel terrible. We drive to a restaurant down the street for breakfast. A waitress comes to our table, warily looks at me and asks if I need coffee. I manage to eat, although I am nauseous. Little did I know that the nauseousness would continue for weeks. Back home, I meditate everyday, but it isn’t until five days later that I feel my elusive connection to the Divine return. I am relieved when the loving energy flows through me, finally breaking through my barrier of fear. During the meditation, I feel prompted to shamanic journey to ask for a healing for myself. A spirit guide and angels immediately greet me. They perform an aura cleansing and remove my damaged energetic body, replacing it with a new one. As they burn the old ‘body,’ a black smoke rises and manifests into a dark entity, which tries to attach to my new energetic body. The angels prevent it, but the entity keeps trying. Finally, one of the angels seals the entity inside a jar, stating he will take it to another realm where the entity won’t be able to find me. I return my attention to the spirit guide and remaining angels. I apologize for allowing myself to become vulnerable to the dark forces. They assure me that we all make mistakes and to forgive myself. In hindsight, I should have meditated or prayed to ask whether Ayahuasca was right for me. And when I read that Ayahuasca is traditionally consumed at night, I should have realized that it might elicit spirits from the dark side. I went in expecting love and light, and instead journeyed to where the angels dare not tread. Although it goes against popular opinion, I do not recommend Ayahuasca. I believe the risks are too great. I think its connection to the dark side is real, and that Ayahuasca is capable of producing images of “enlightenment” to entice people to ‘dance with the devil’. Despite my belief that the dark force is an illusion, I know that all thoughts have power and are capable of trapping us within their archetype belief system—derailing us rather than helping us. While I consider the Ayahuasca experience to be the worst night of my life, I have managed to glean several positive things from it. First, I came to realize how much I love my husband. Second, my meditation sessions seem more intense, probably because I appreciate the divine connection more than I ever did before. And finally, I am much more conscious of my thoughts, and focus on being in the present moment because that is the closest we can get to eternity within this marvelous and sometimes dark illusion called life. For more insights, read the post The Ayahuasca Party Crasher.